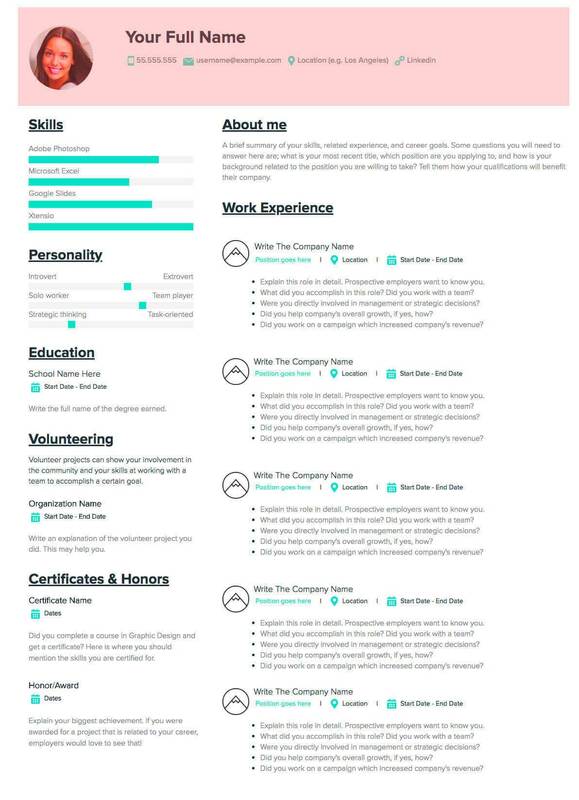 Your resume is the first impression you make while applying for jobs. 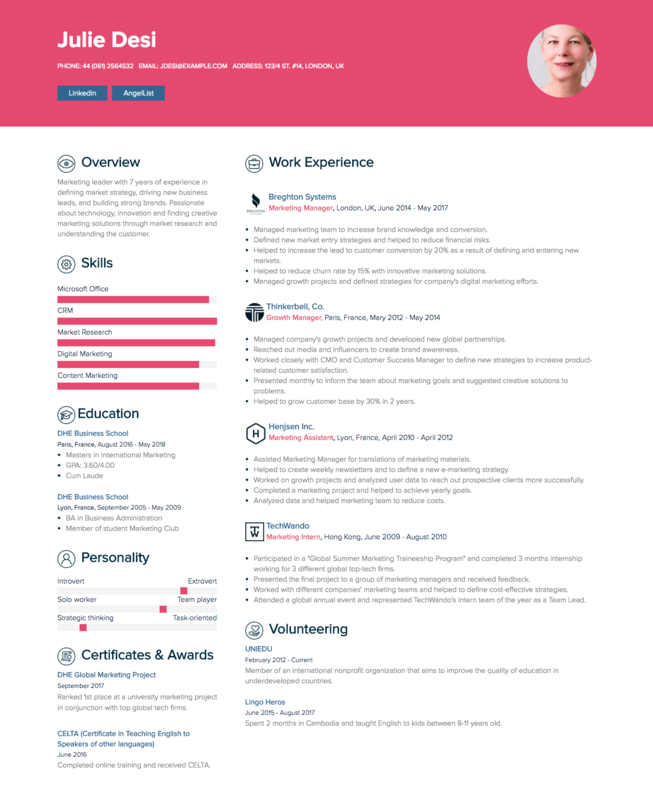 This means that your resume needs to showcase all the important details about your professional background clearly and accurately. 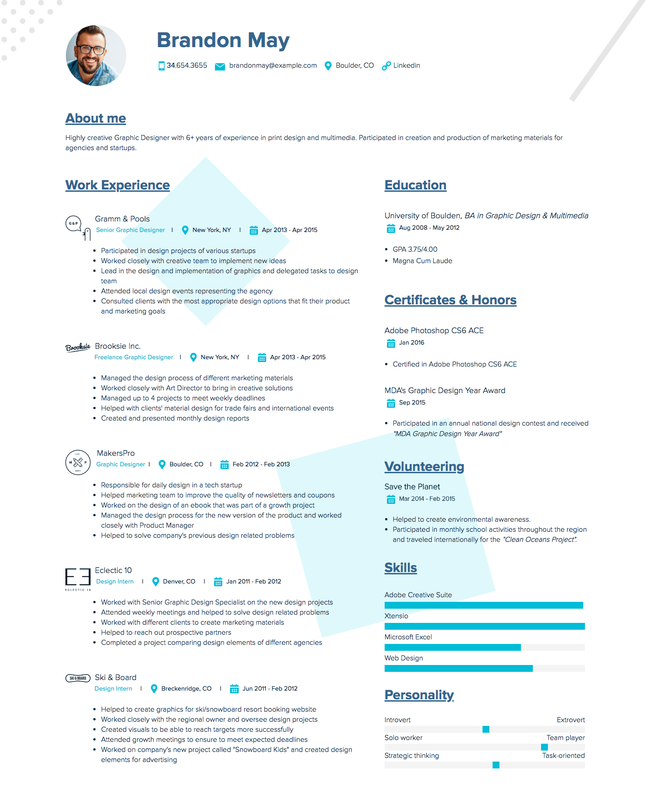 Follow along with the instructional copy in Xtensio’s resume template and the tips in this guide to create a powerful resume that will help you land your dream job. 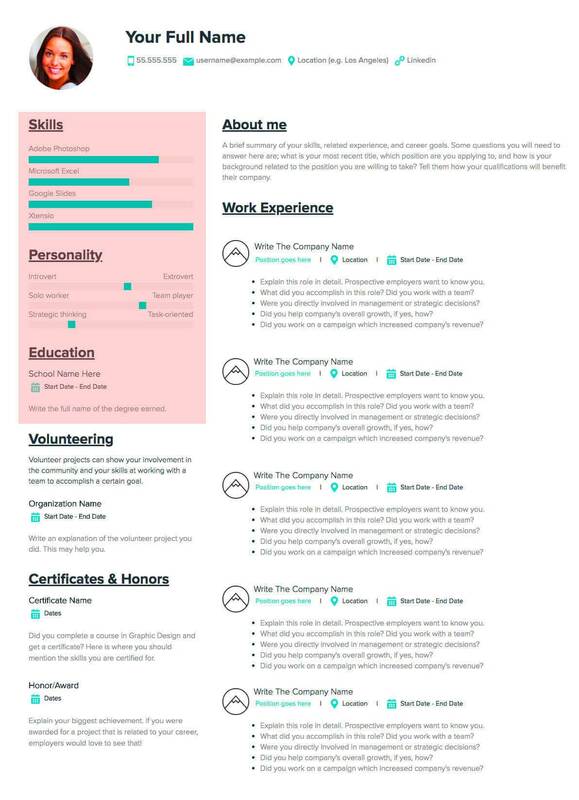 Start making your Resume for free! 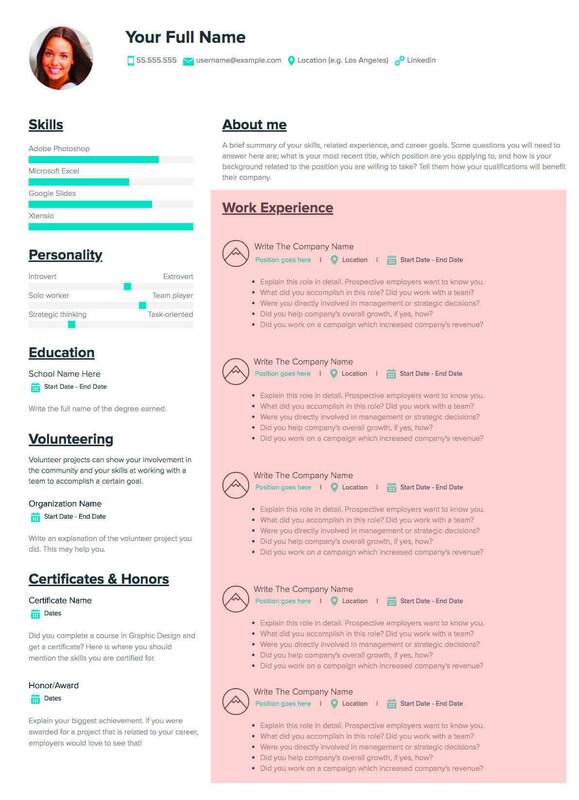 Your starting point to create and share a beautiful resume, without any design experience. Misspelling your name on your resume can be extremely detrimental to your end goal of landing the job. This may create doubts about your professionalism and confusion about who you are. That being said, make sure your name is spelled correctly! You can also share your professional social media links to avoid possible confusions and further outline your experience. You may also want to include a recent, high-quality photo to put a face with the name. After outlining who you are, you want to tell hiring managers how they can get in touch with you. Make sure you provide your email address and phone number so that the company can get in contact to set up an interview. It’s also useful to add your current address to your resume, as some companies will only consider people who live in a certain area. What skills do you have considering your previous professional experience? Which position are you applying to and why? What are your overall career goals and how will this position help you reach them? 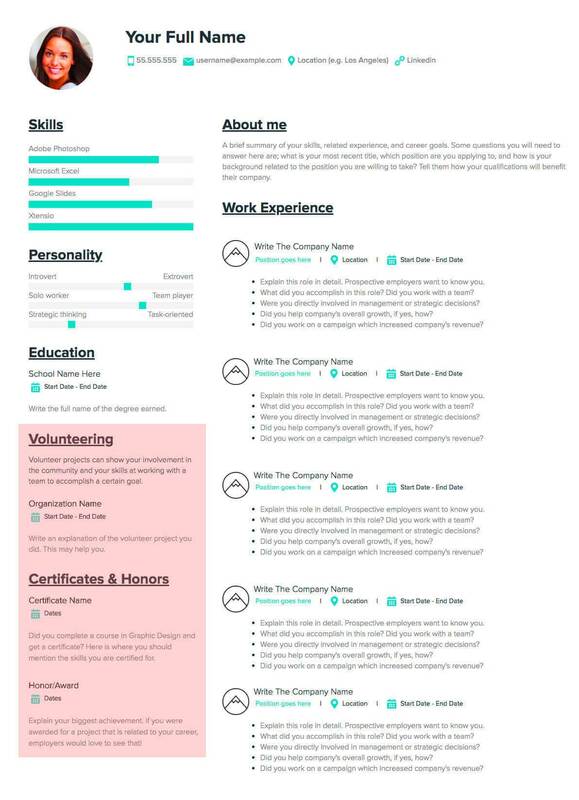 Here are some tips and tricks for filling in the Resume template. This section of your resume should highlight your professional skills that are most related to the position you are applying for. Make sure to read the job description carefully and highlight the required skills (if you really have them of course). You can use the sliders to define how experienced you are with each particular skill. The personality section should follow the same general rules. You want to highlight the factors of your personality that align with the position. It’s important to remember that there are no right or wrong personality traits, but rather, your personality should fit with the position you’re applying for. If you are applying for a position that requires an extroverted personality and you are a true introvert, you might be applying to the wrong position. Accurately defining your personality on your resume will save everyone’s time and will eventually lead you to a job that truly fits your personality and abilities. Bonus tip: If you’re having trouble pinpointing your skills or personality traits, filling out a personal SWOT analysis can help you get an overview of your abilities and interests. Defining your strengths and weaknesses will also help you better prepare yourself for interviews. Highlight your achievements: Did you complete university with an outstanding GPA? Did you receive any scholarships? Activities: Were you a member of any student club? Were you part of an academic fraternity? Did you participate in any school events related to the position you’re applying for? Did you complete a study-abroad program? Leadership: Did you lead a team of students during a project? Were you part of a club committee? Don’t underestimate your educational experience. All of these points can help you stand out from other applicants. Volunteering is important for personal development and can help improve many professional skills. Strengthen your resume by showcasing these experiences. Indicate important volunteer projects that you were involved in, including the name of the organization/association and dates you actively participated. Professional certificates can help grab the attention of hiring managers and can help prove that you do indeed have the skills you claim to have. If you completed a course and obtained a certificate in a related field, you should mention this on your resume. Additionally, if you received any awards or honors in school or at a previous position, these should not be left out of your resume. You don’t have to go into all the details, but simply state the name of the award/honor, date, and what your accomplishment was. In many scenarios, your previous career experience is the best indicator of your eligibility for the position you’re applying for. If you have experience in a field similar to the one you’re applying for, this section of your resume is where you need to focus on the most. Include dates (start-end), the location of the company, title of the position, and details of your skills and experience gained in that position. Typos can make an applicant look inattentive to details, and may make the hiring manager skip over your resume altogether. Even if you generally have impeccable grammar, you will want to make sure you edit, and re-edit, your resume before submitting a job application. You may even want to have a friend, colleague or relative go over your resume to help make sure that it is polished and professional. 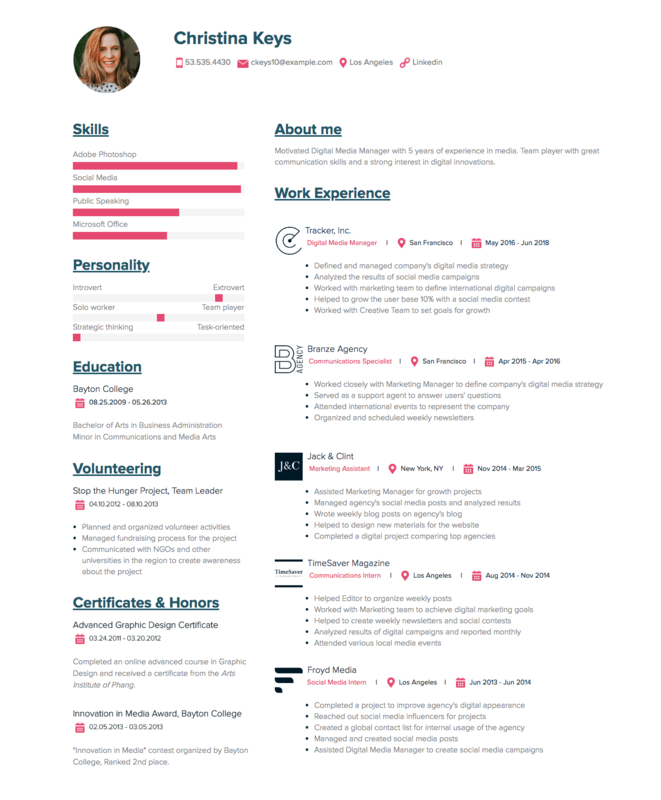 It’s important to create your resume with a tool that allows you to easily adapt it as your career evolves. 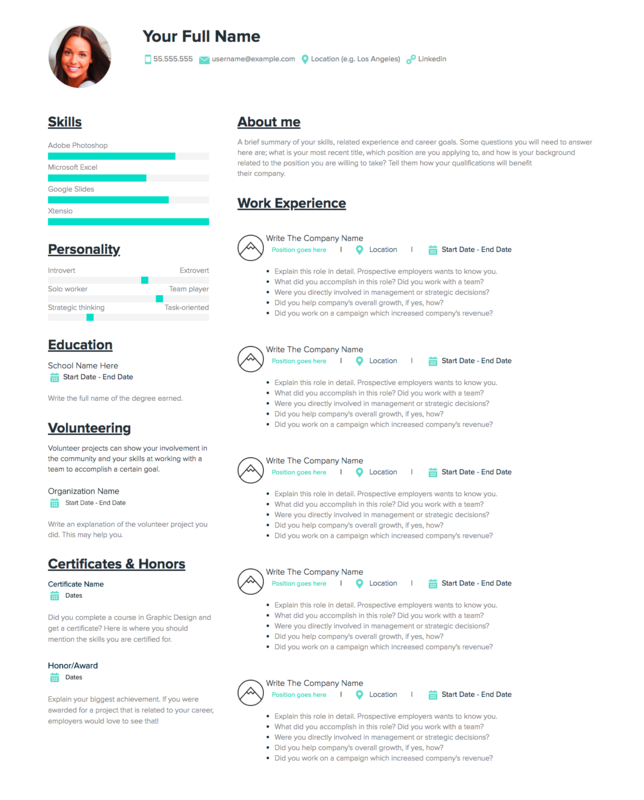 The resume template is adaptable just like other Xtensio tools. It can and should be repurposed, revisited, and revised to suit your evolving needs. You can always add, delete, and move your modules and sections around with Xtensio’s versatile editor to adopt the resume as you need it.